the correct ring, so pictures taken were spotty. The interior element was done in two rooms in the old city jail. In the vehicle search they used the antique tractors and trucks. Last edited by Cressrb; 03-12-2019 at 03:24 PM. I'm sure it's there. Only allowed me to download 5. Going to try a few more here. I love the photo where he's looking at his ribbon...like, why is the HUMAN holding that? I earned it! Yup! Got a bit of the EPAD going. Woot Bonnie, Daughter and, of course, Duggan! Yes, it makes these trials so much fun. I think everyone would enjoy the sport. 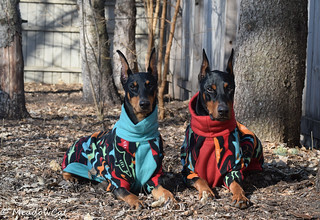 We were the only Doberman there. Our shows in Utah are so few and far between. You wait a year and then are lucky to get the bid. Traveling is a must here. The show in Utah last Oct. was superb, too. Held at the old Fort Douglas which is historic in itself. Anyone would have liked it. friendly. The dogs love working - and the personal satisfaction you get in training and seeing the result. So everybody - check it out! Say... Have you ever taken a trip North from your land to Virginia City Montana. Its a super old mining town that has been restored. Nice trip. Near Ennis. I would guess 110-120 miles North of Squirrel. I think that you would find it cool. Seems every where we go lately it is as fast as we can get there. Ennis, Mt. Pure heaven. I did not want to leave. My son and family just moved from Bozeman after living there 7 yrs. buy if you are just starting out. in Bozeman was to make it another Jackson Hole. Wy. thus the inflation there. Doc, this is for you. I found the saloon! Tell all of Team Duggan - Great job ! Saloon......OK we can all rest now...whew!!! Cheers!!! Cool pictures. We'll have to get there whenever we are back in Colorado. My sister-in-law was born in Montrose, back when my father-in-law was the city manager (late fifties/early sixties). Well, how interesting is that!! Looks like a really fun venue! Would there be enough dogs if you could create and interest and start a meet?